This design originated with a pre-war American light cabin monoplane of 1938 built in England under licence. 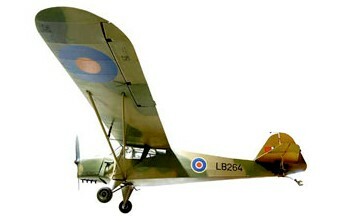 Successful trials with impressed civilian Taylorcraft Plus D aircraft by the Army for artillery spotting duties led to the introduction of the first fully militarised Taylorcraft, the unarmed two-seat Auster I. One hundred were built, entering service with No 654 Squadron in August 1942 as the first fixed wing aircraft in British Army service and along with the succeeding Auster marks III, IV and V they served in with the Desert Air Force in North Africa, and in Sicily, Italy, and with the 2nd Tactical Air Force from Normandy to Germany in 1944-45, flown by British Army officers trained by the RAF. The survivors were sold out of front-line service by 1946, though the Fleet Air Arm operated a few in second-line units.